"The Frozen Autumn creates what the band calls "Frozen Wave", that is to say an original, innovative kind of Electro-Coldwave blends melancholic male and female vocals, atmospheric gothic-wave, and 80s-style electropop. The result is an artistic collage of seamlessly blended styles and genres. The new album, "The Fellow Traveler" is the finest work in the band's two and a half decade career. Featuring a cover of "Loving The Alien" by David Bowie. " 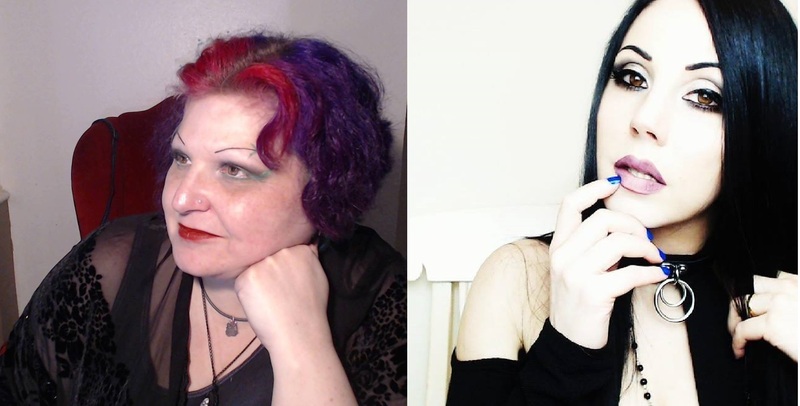 This month we are discussing the good, the bad, and the ugly of aging in goth culture, we are reviewing the new album from Bootblacks, there will be a special guest appearance by Emz from HorrorAddicts.net,, and we are chatting about goths on YouTube, and the ethics and responsibility that comes along with that. Our Guests this month are Angela Benedict and Skullgirdle! Emz is the head spook at the HorrorAddicts.net website and podcast! Check out her most recent vampire novel, Dusk's Warriors! In the age of the world wide web, goths have more opportunities to meet and share their thoughts than ever before. No longer do we have to create and publish our own zines, start a band, or run a goth event to express a sense of cultural identity and community. We are now able to project ourselves, our lives, and our scenes in HD video for the whole world to see and talk about. This has allowed our dark little culture to be opened up to a whole new audience of potential goths who may become seduced by the dark side and help create and participate in the culture, even if they don’t have a local scene. But does this type of access actually encourage goths to stop engaging with their local community? Is the emphasis on visual presentation having an adverse impact on the values and norms of the culture? That and more is what I’d like to explore this month.